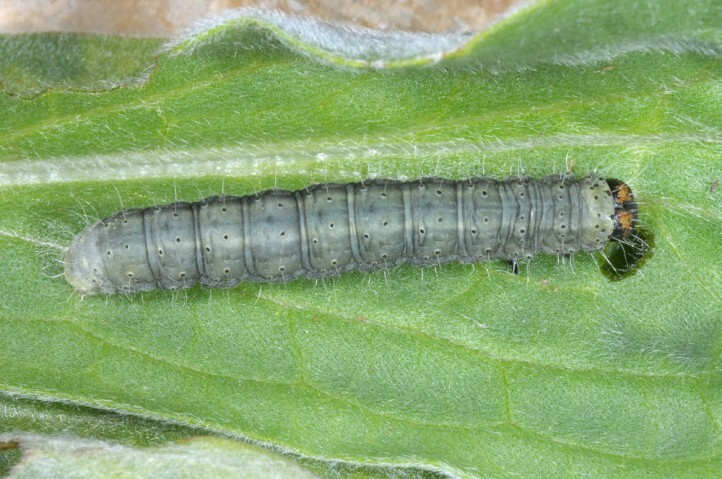 According to own observations the larvae feed on Solenanthus stamineus (Boraginaceae) on Mount Chelmos (Peloponnese). 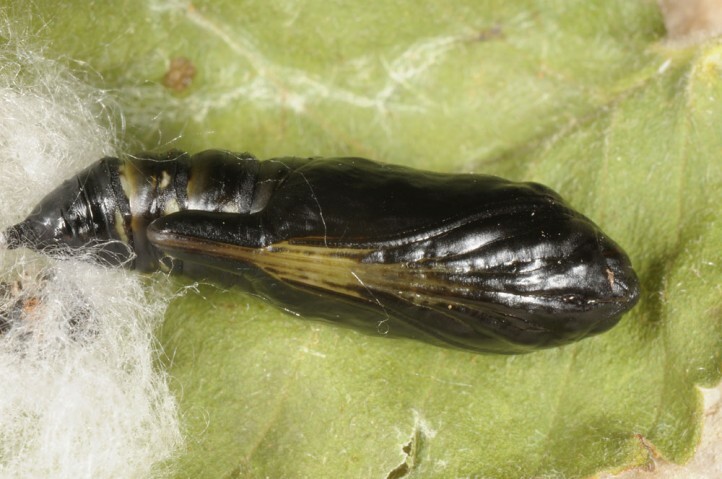 In the Crimea larvae could be found on Rindera tetraspis (Vladimir Savchuk). 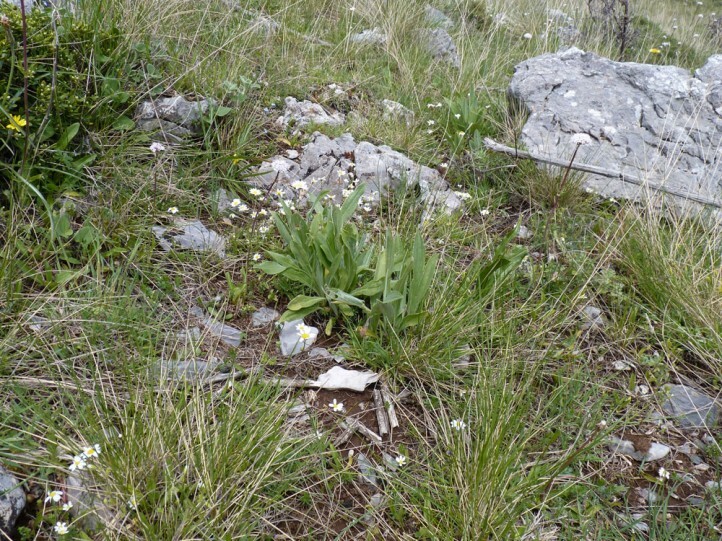 On Mount Chelmos a closely related species (Rindera graeca) occurs as well. 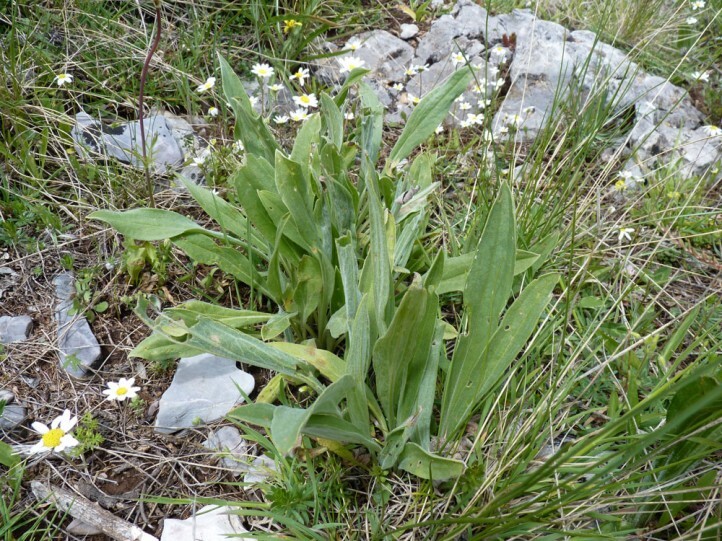 This species is probably also used as host plant, but surely to a much less extent than Solenanthus. 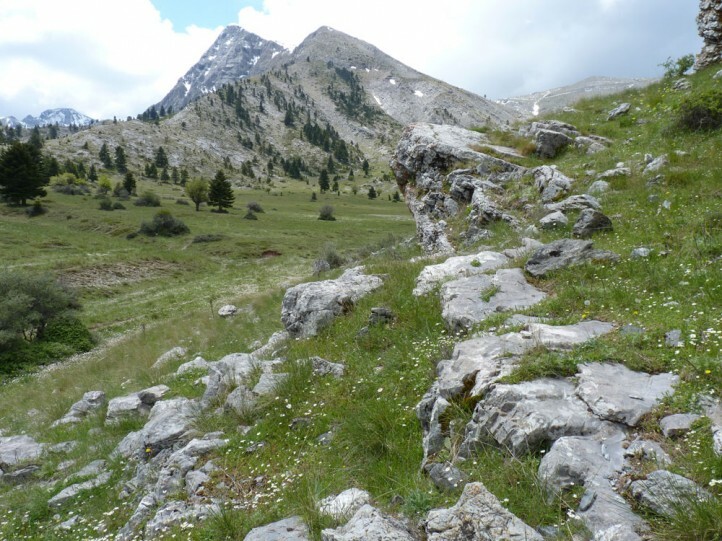 The specis settles in sunny large-scale pastures of higher mountains (from 1650 up to at least 2200m in Greek Chelmos) and on dry slopes of also lower elevations in natural steppe regions (e.g. 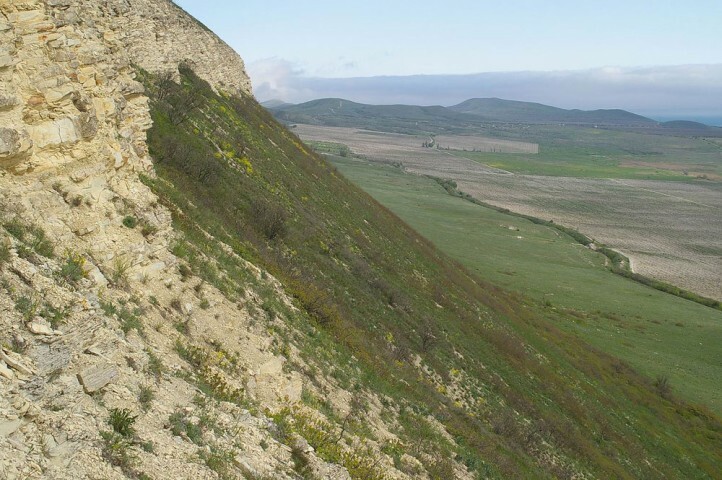 Ukraine). 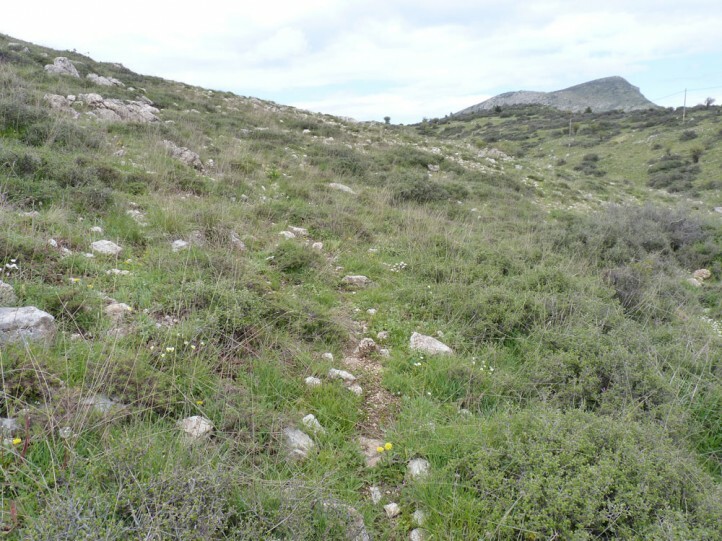 Most often rocky and south orientated slopes are involved, but I also found larvae in then lower density in other orientation than south on Mount Chelmos (2016). 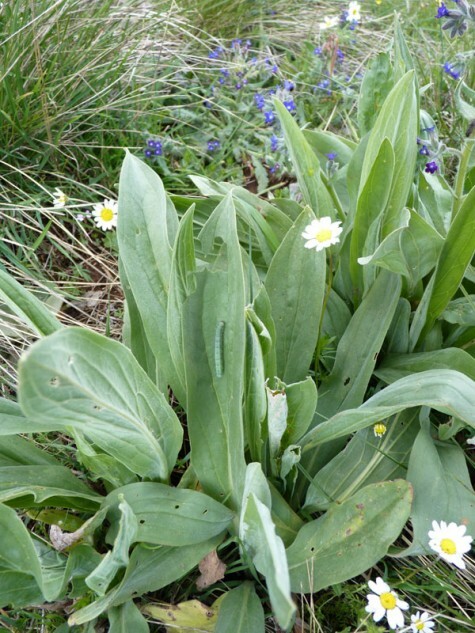 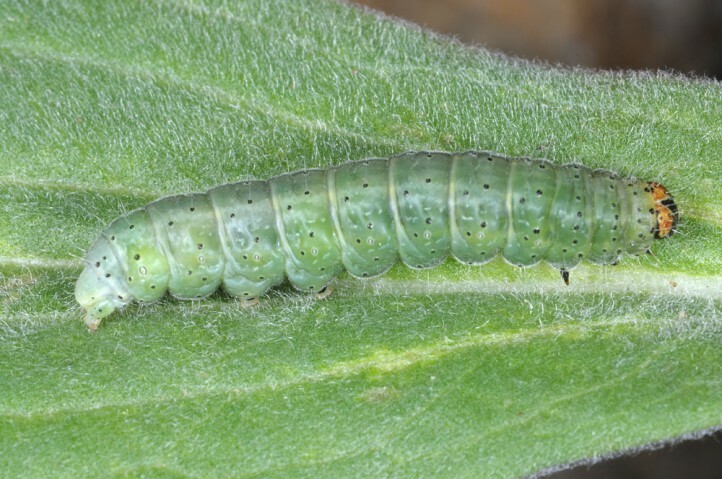 I recorded the young to fully grown larvae in 1700-1800m on Mount Chelmos already in early May 2016. 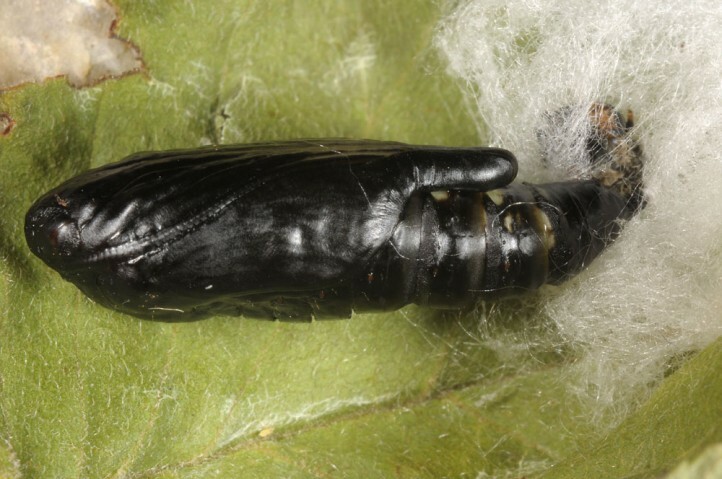 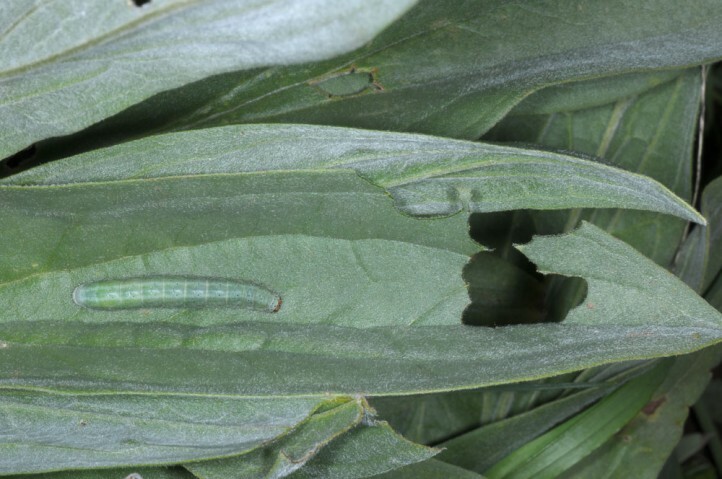 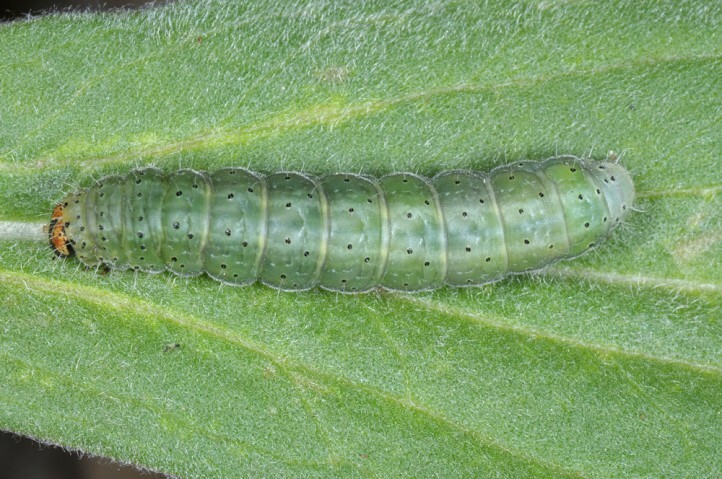 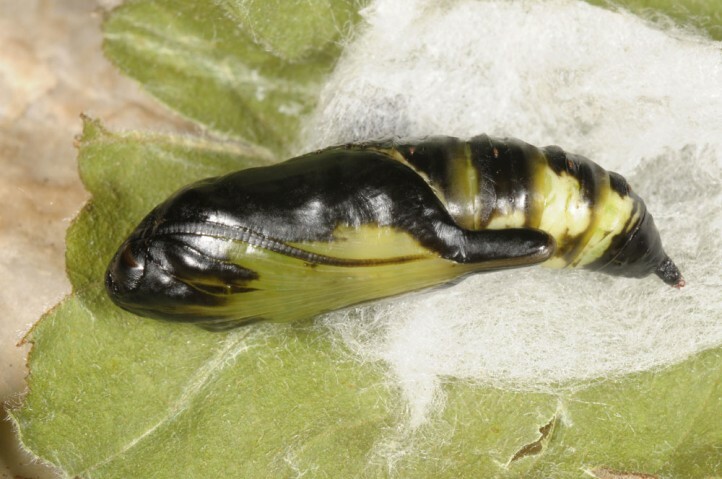 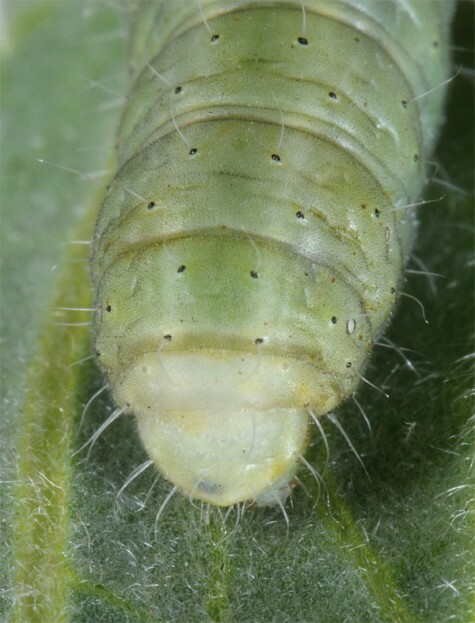 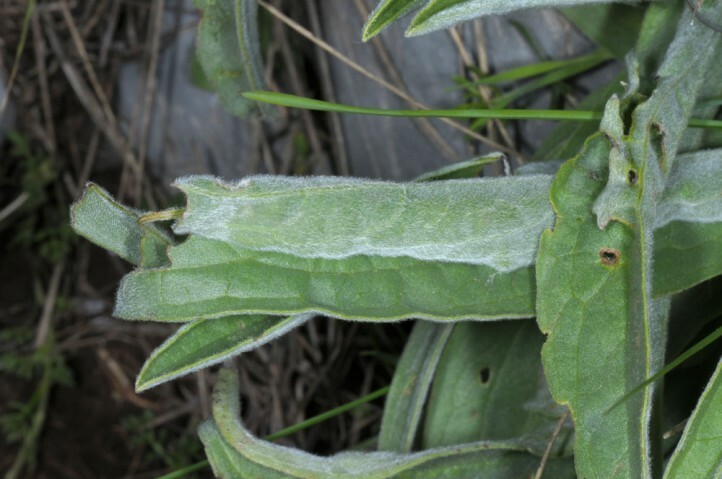 The larvae live in a spun shelter made out of leaves of the host plant. 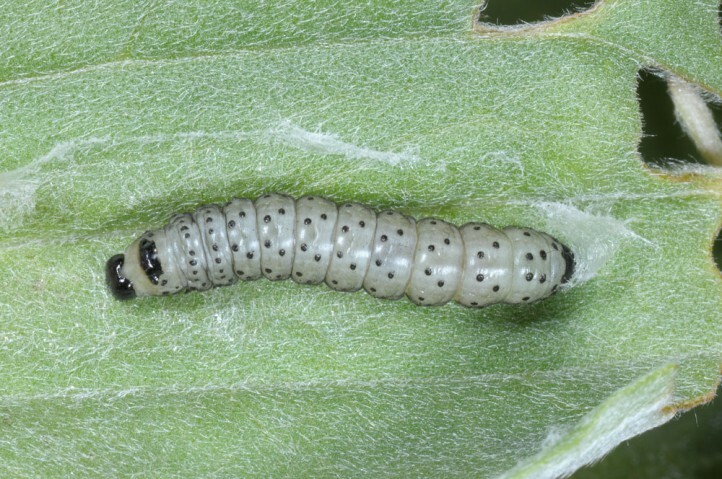 The young larvae are obviously not correlated with inflorescences. 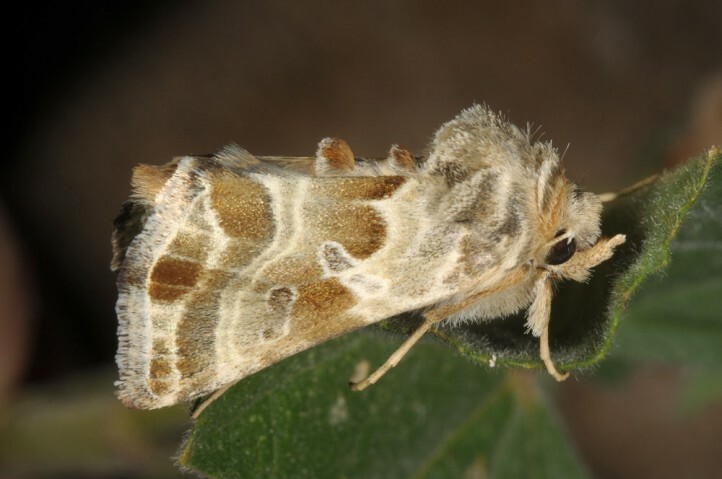 This is contrary to the closely related Euchalcia italica (the young larvae of which I recorded so far always in inflorescences). 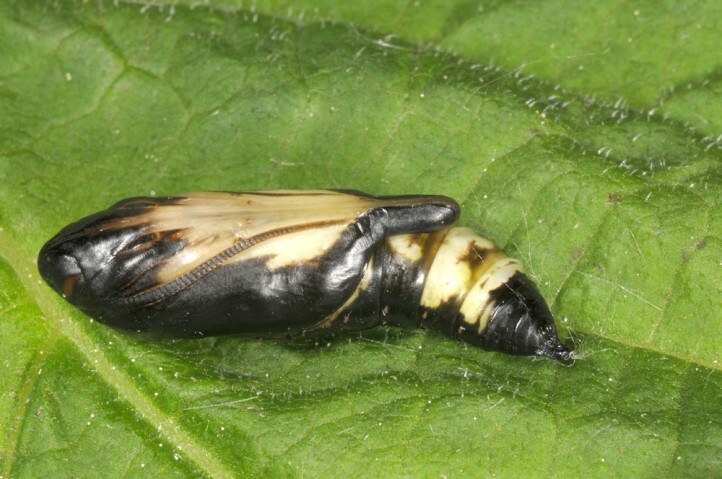 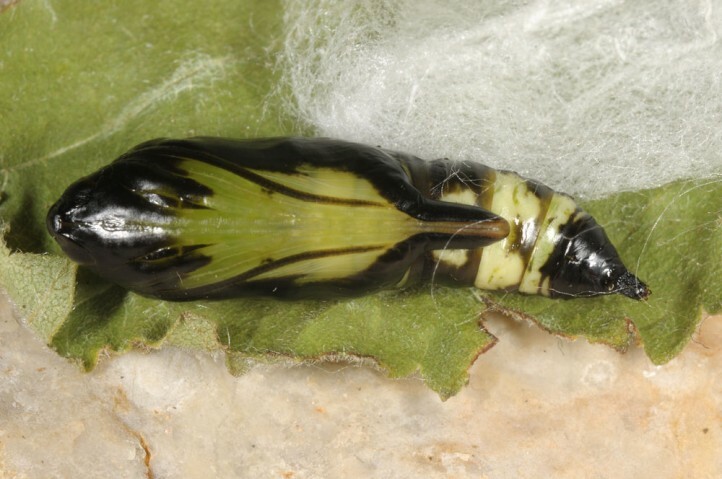 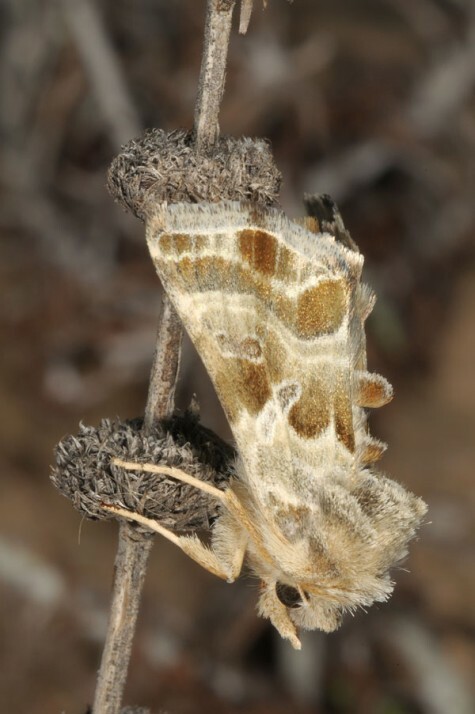 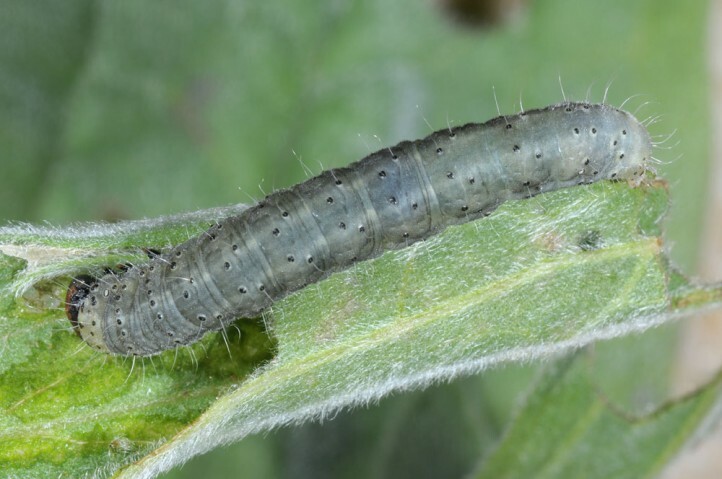 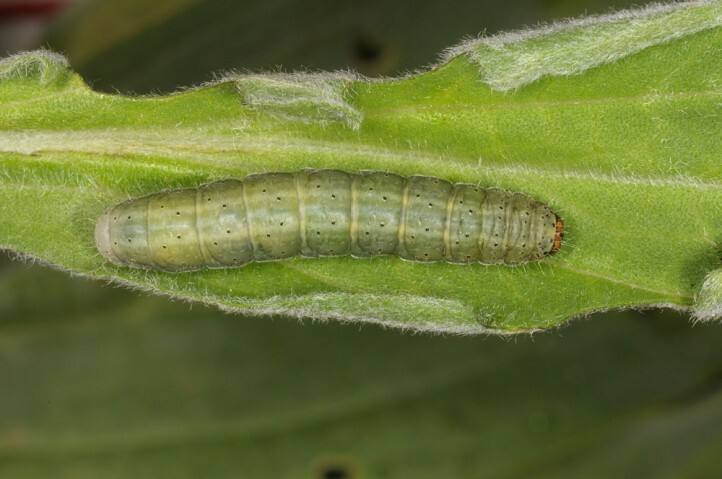 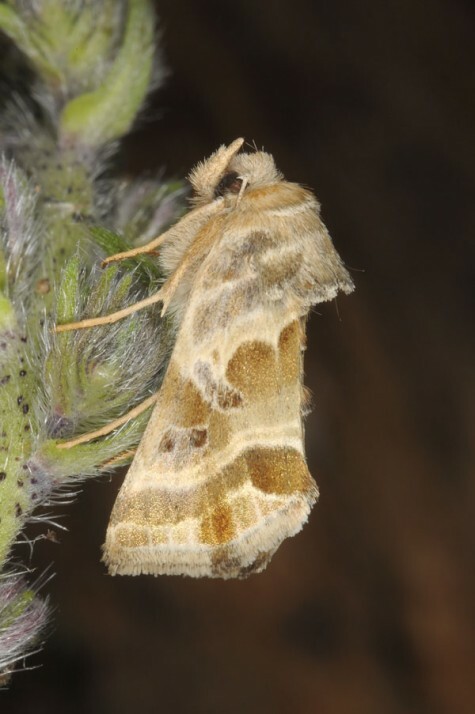 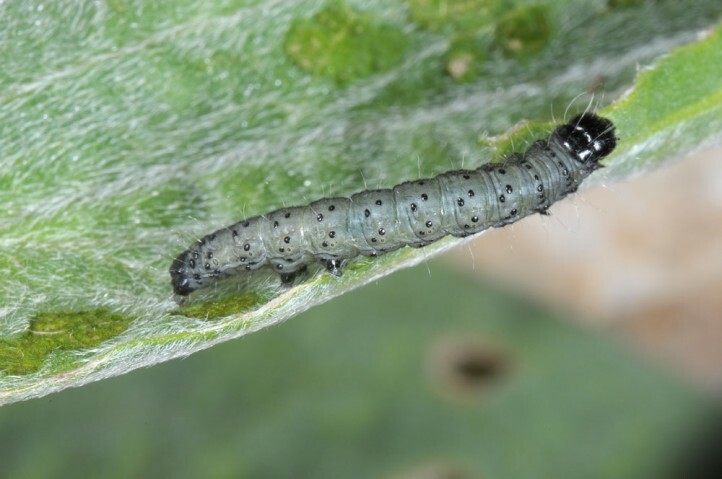 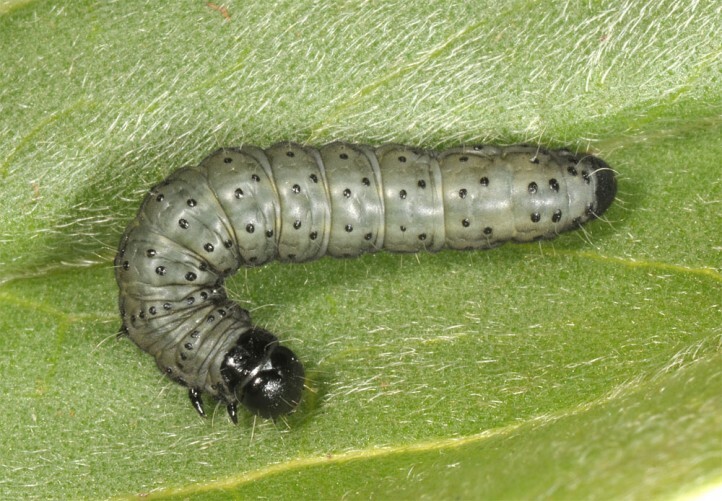 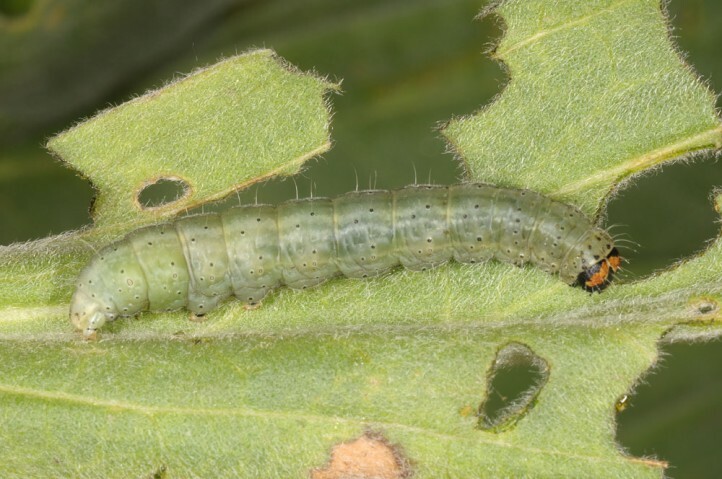 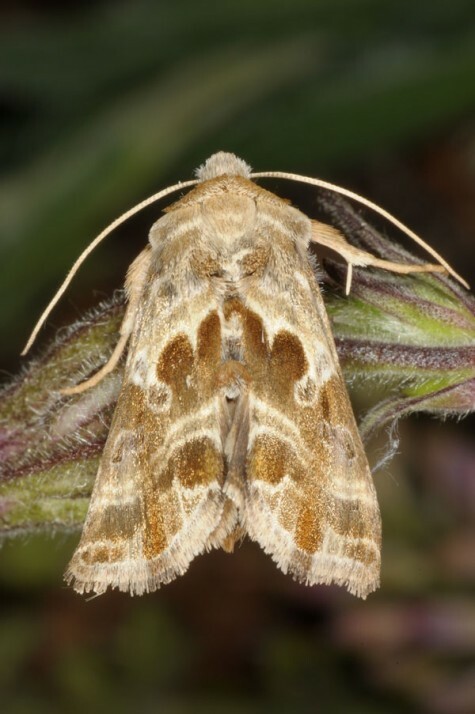 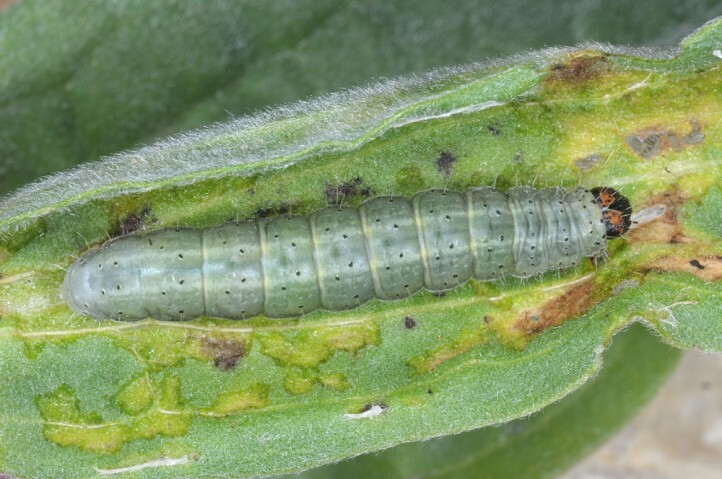 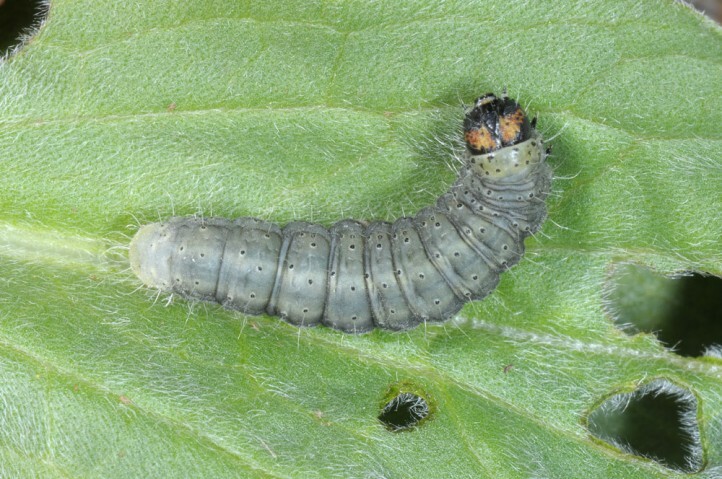 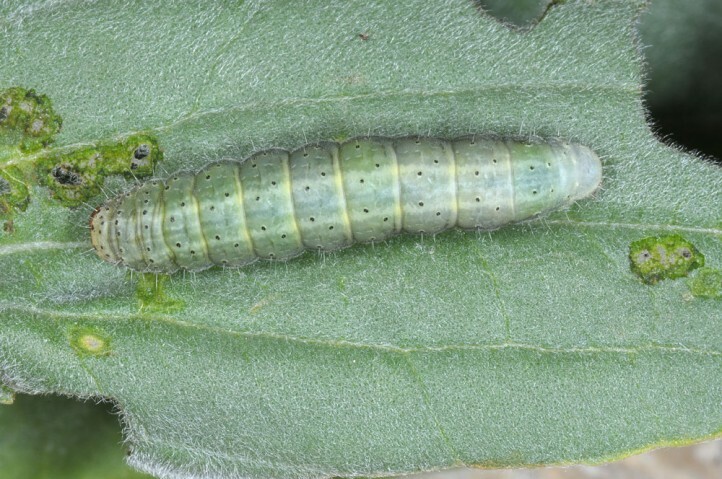 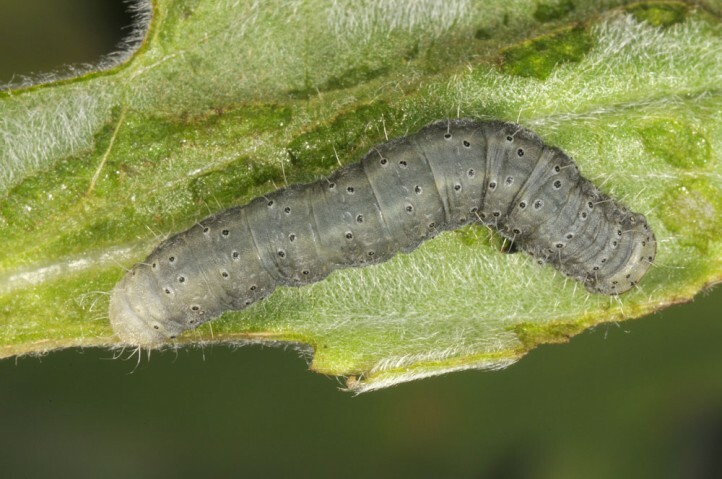 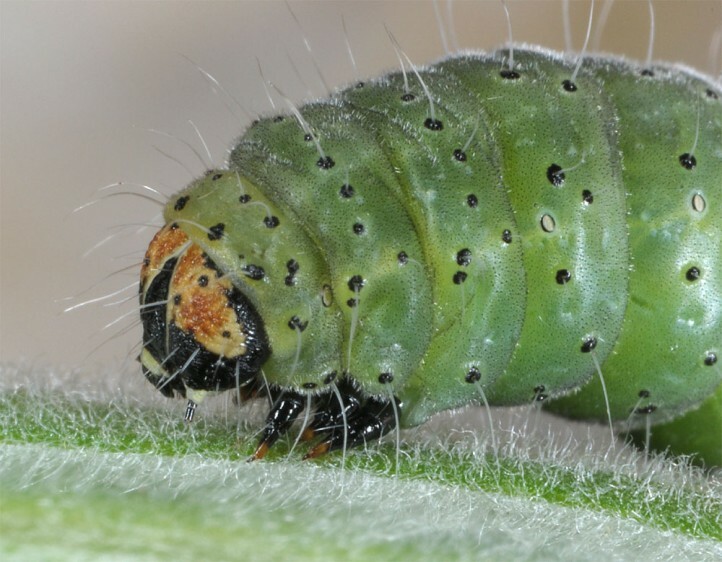 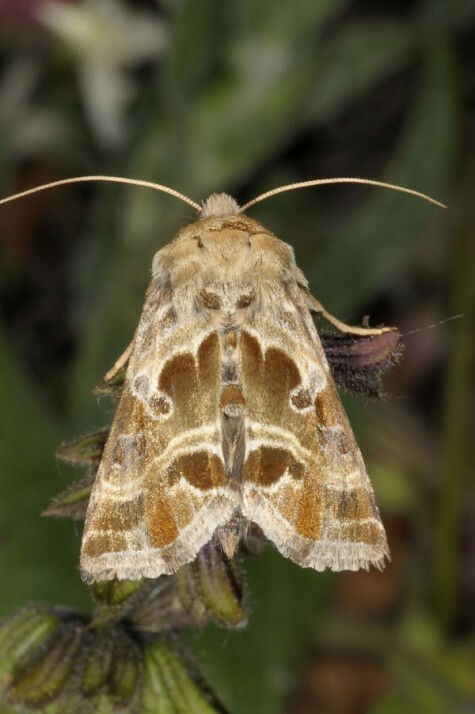 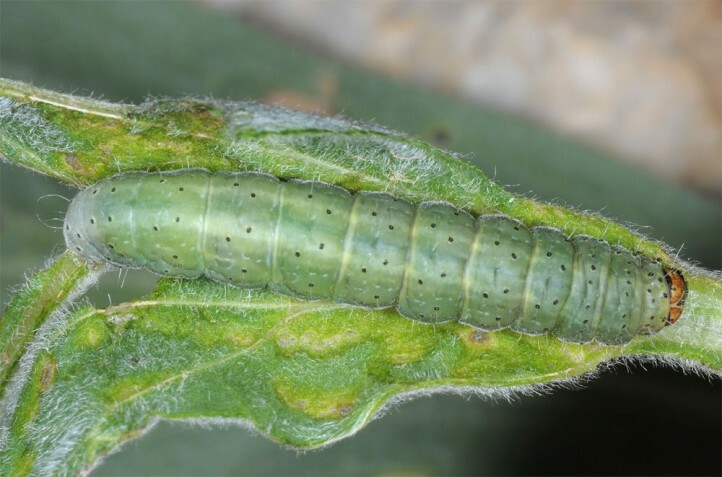 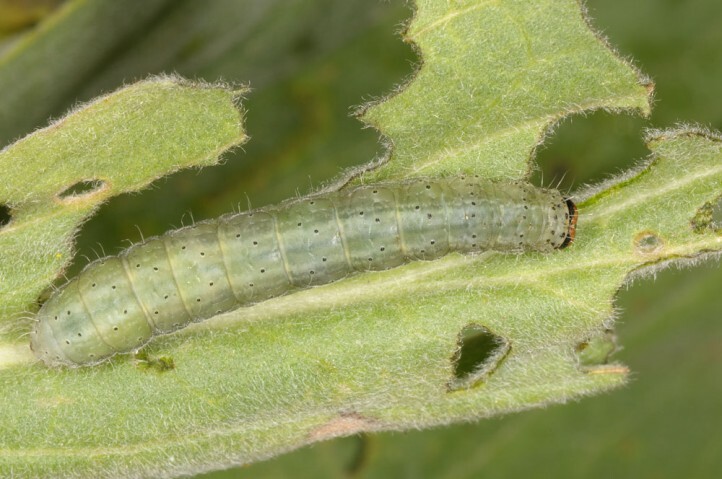 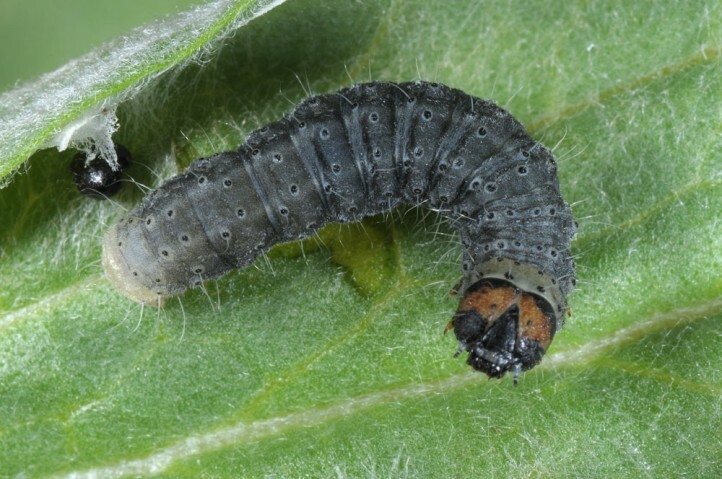 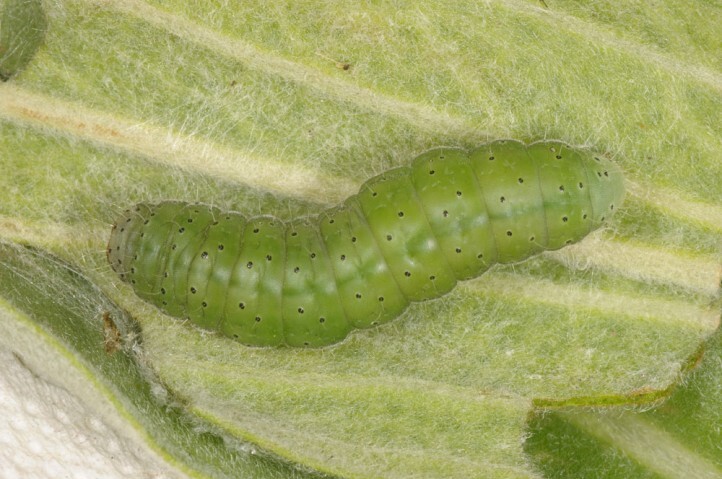 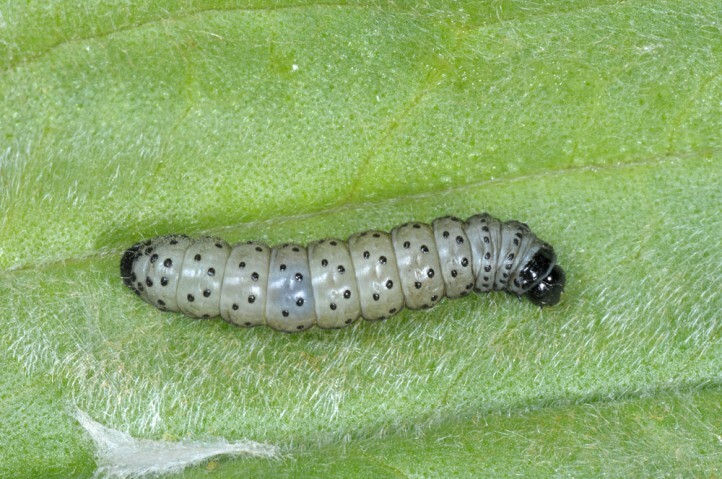 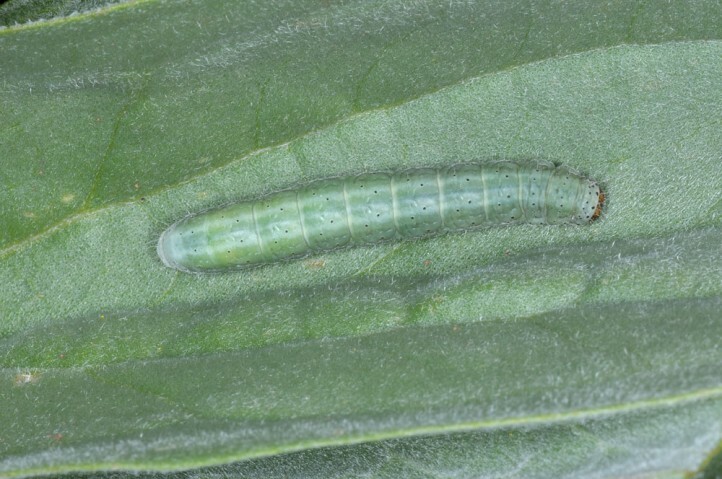 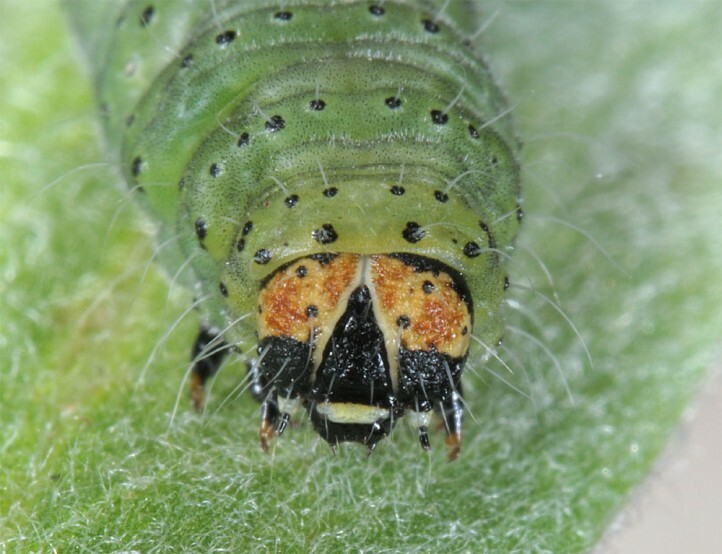 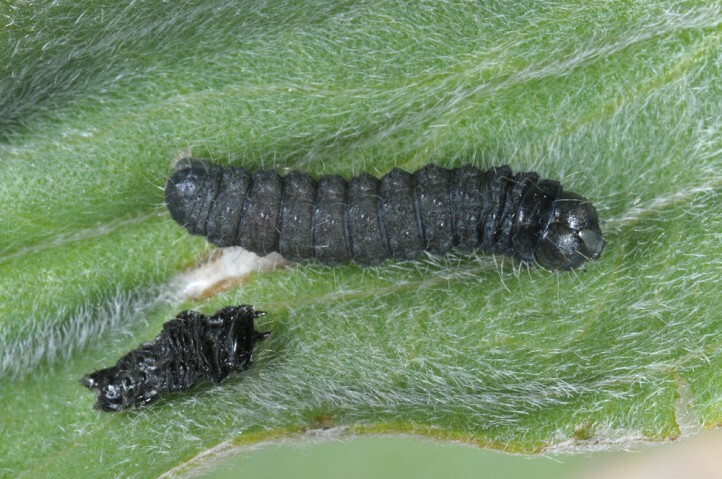 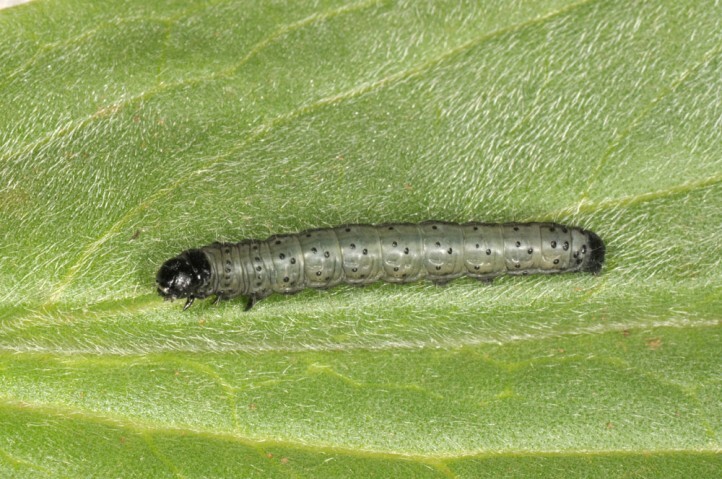 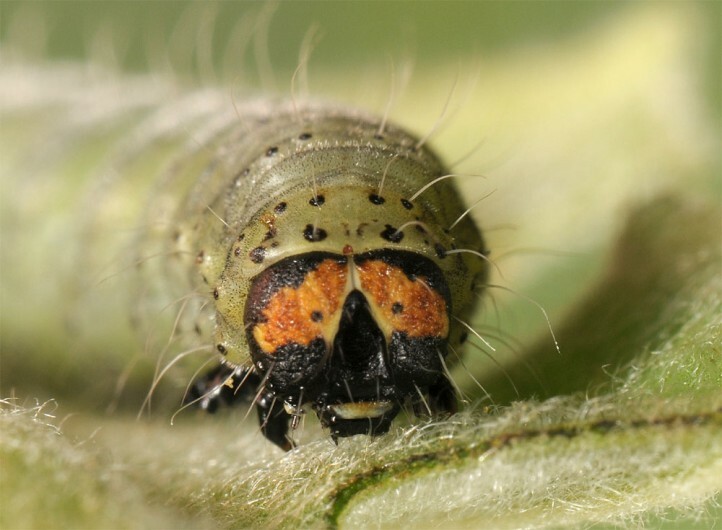 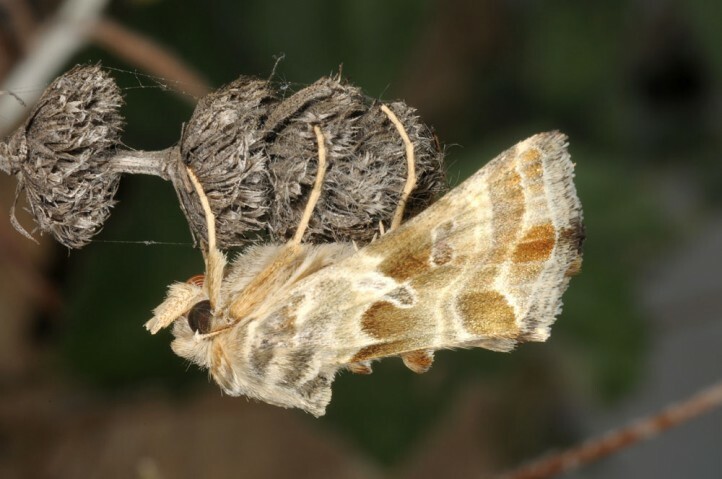 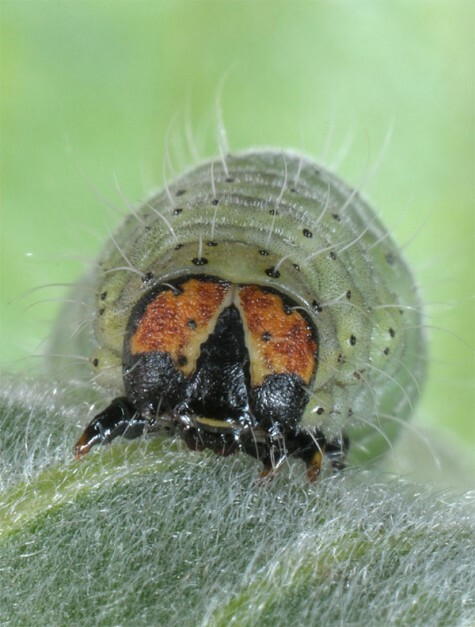 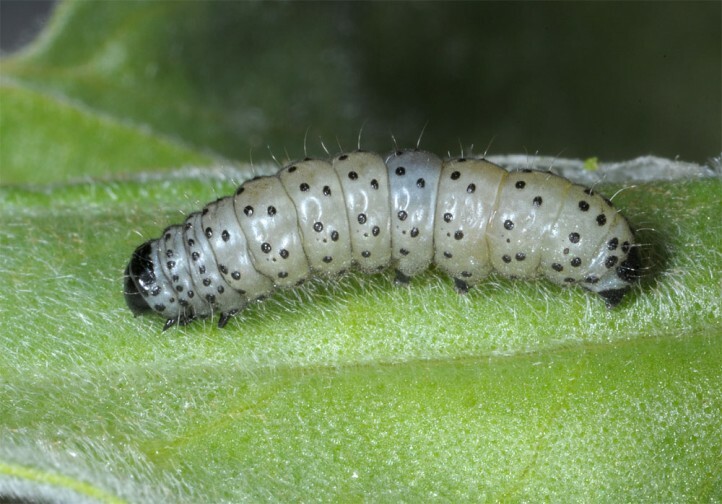 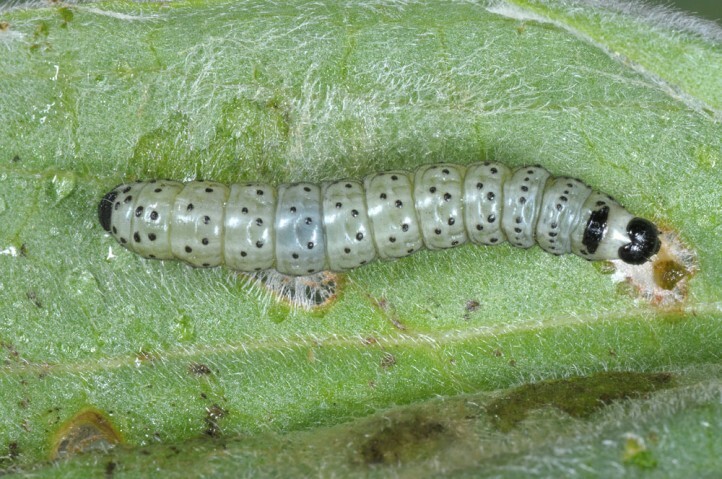 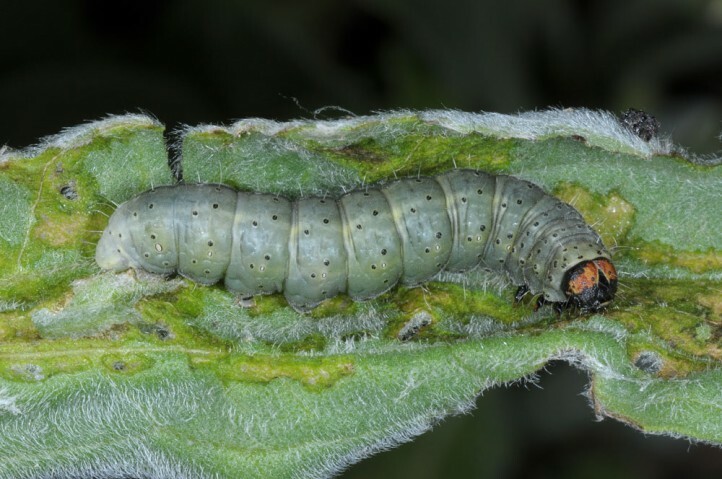 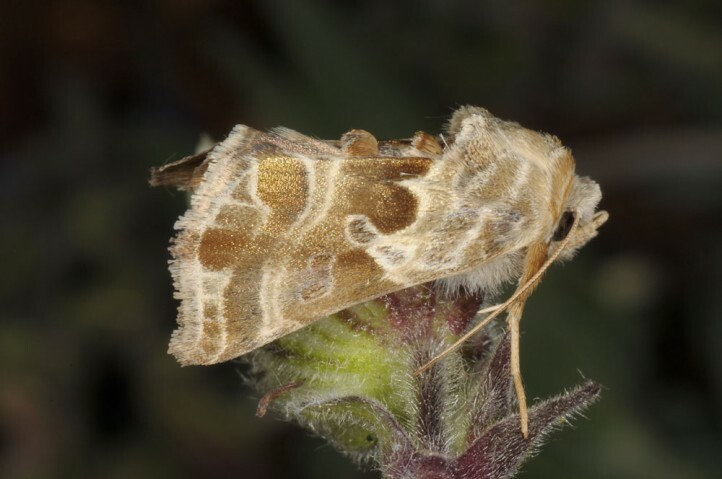 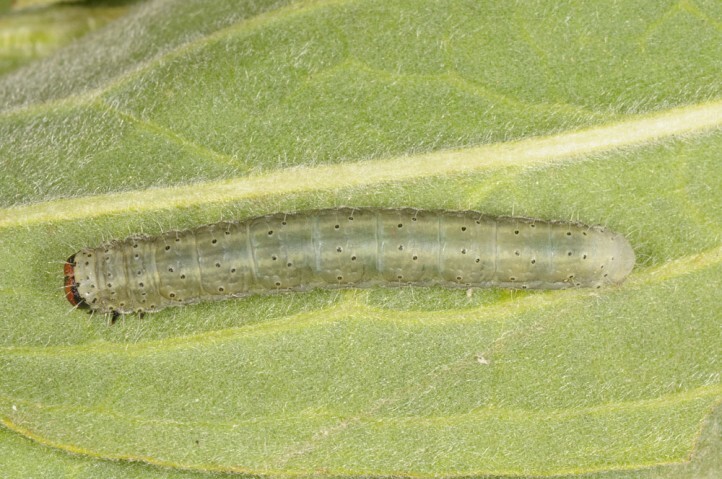 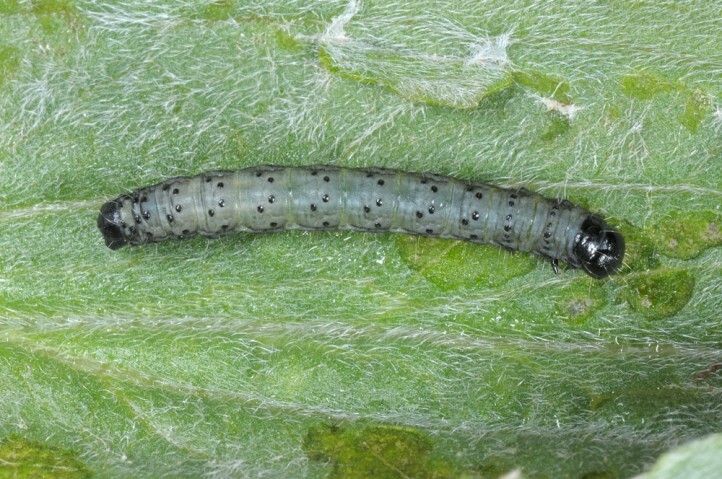 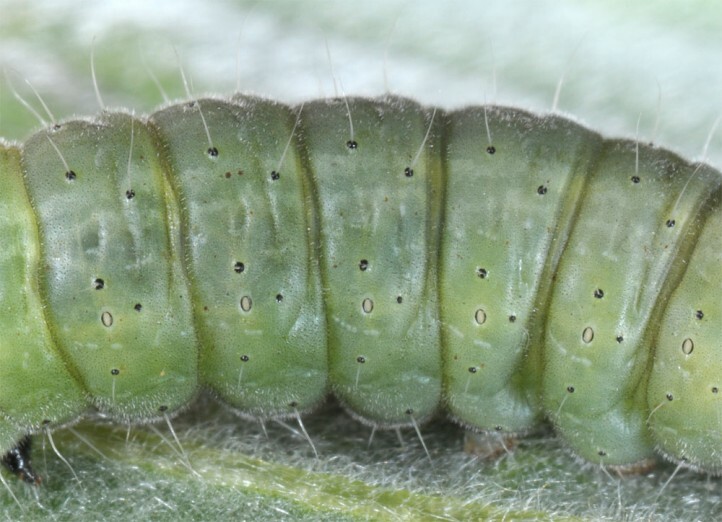 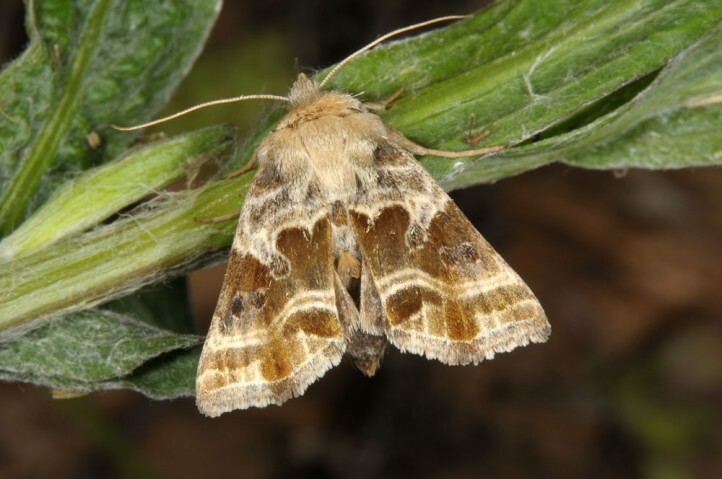 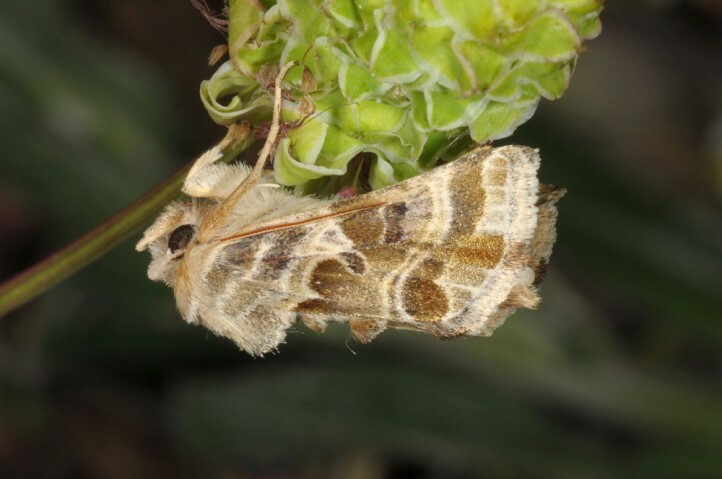 In years with warm spring as 2016 mature larvae can be found from early or mid-May to late May, in cooler ones supposedly between late May and early or mid-June. 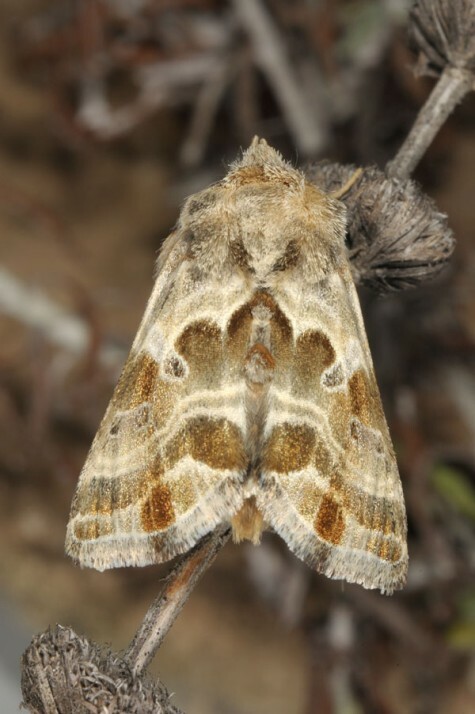 In hot years the flight time will start already in late May, otherwise moths will be found still in July or even early August. 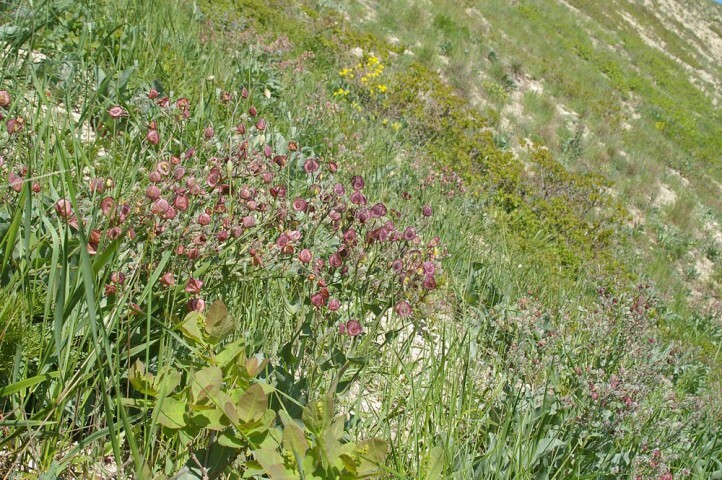 In lower elevations life cycle should be corresponding earlier. 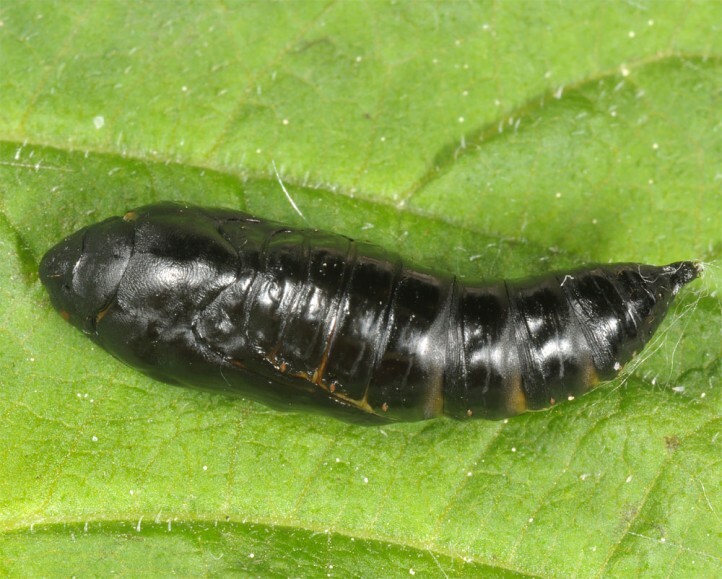 According to Vladimir Savchuk larvae are mainly found between mid-April and early May in the Crimea (about 150-200m asl). 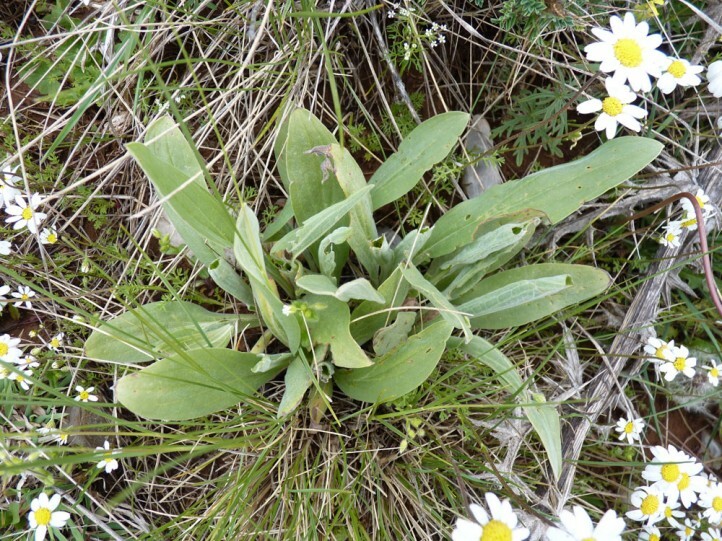 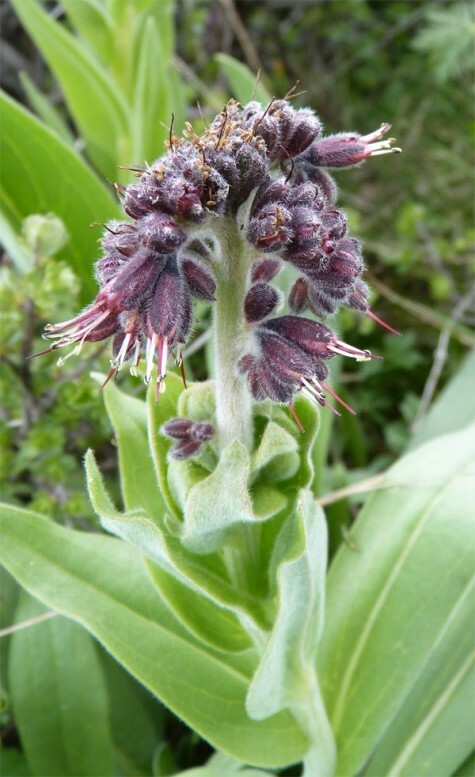 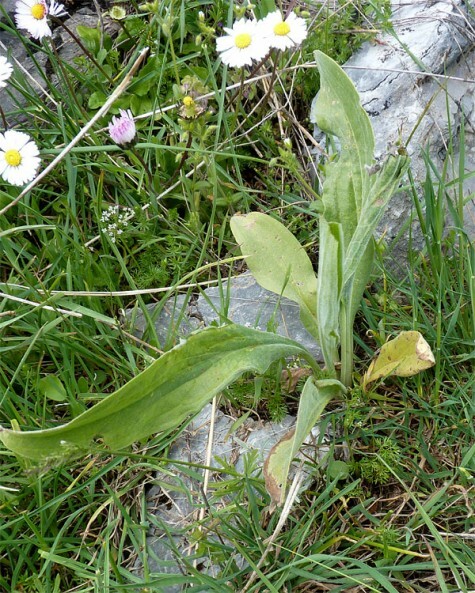 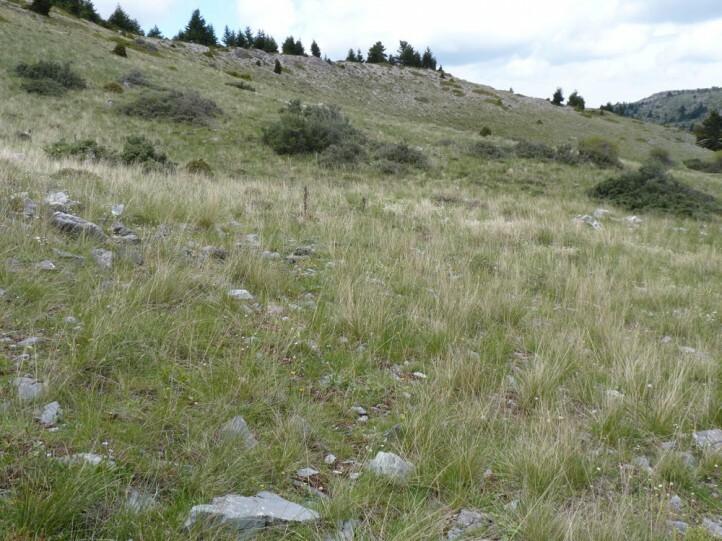 Euchalcia siderifera is not severely endangered on Mount Chelmos provided that moderate grazing is continued. 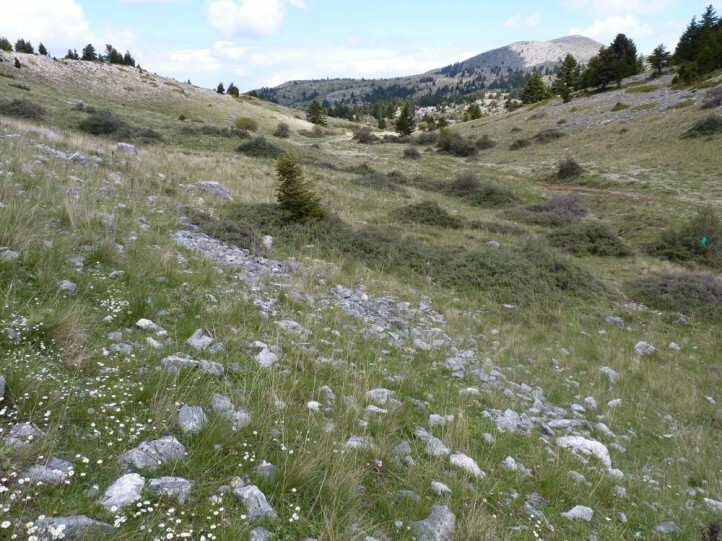 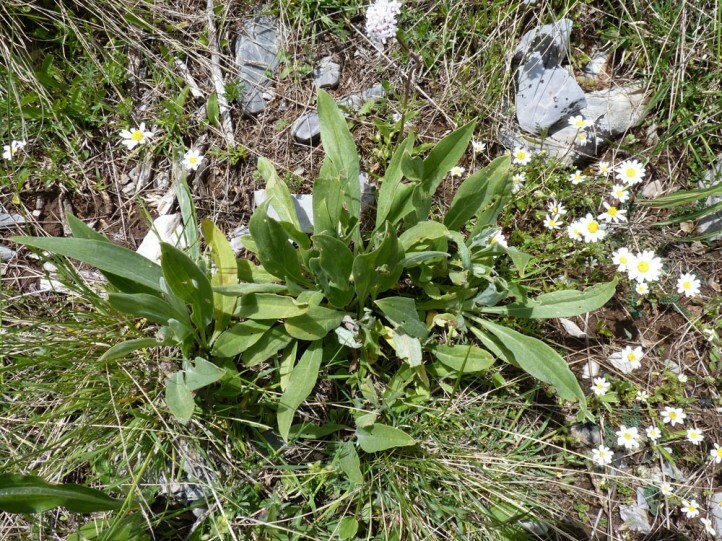 But Euchalcia siderifera has already lost important area there because of the construction of the ski resort. 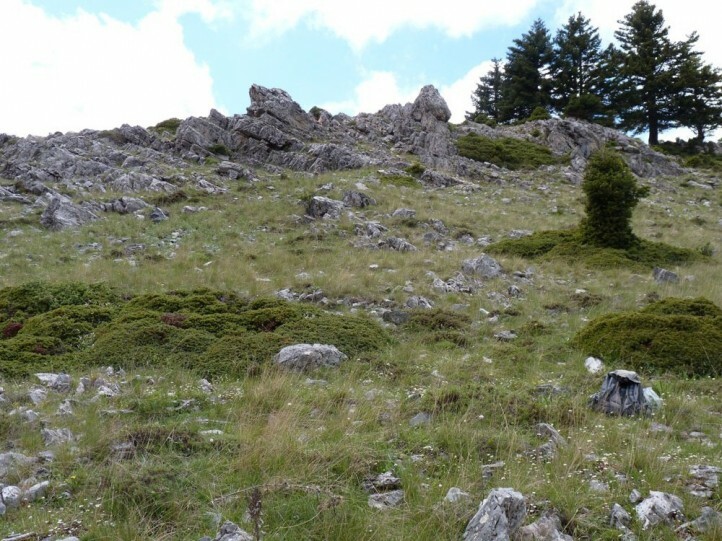 This resort must not be expanded any more! 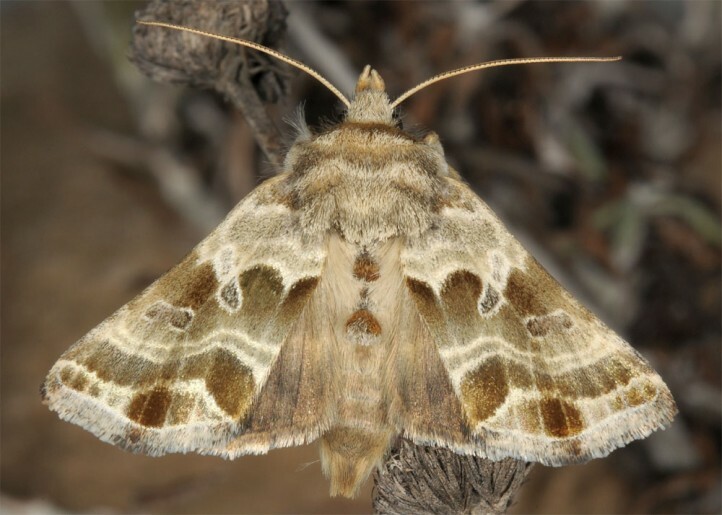 In Europe Euchalcia siderifera occurs in the subspecies achaiae Dufay, 1968 on Mount Chelmos in the Northern Peloponnese. 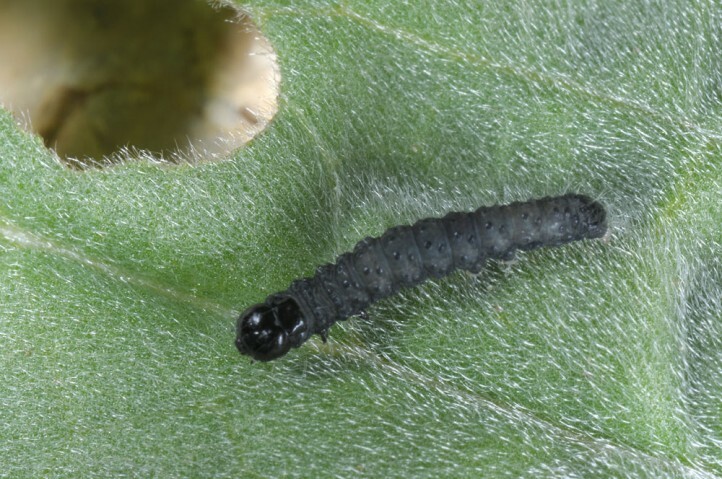 All other data (e.g. 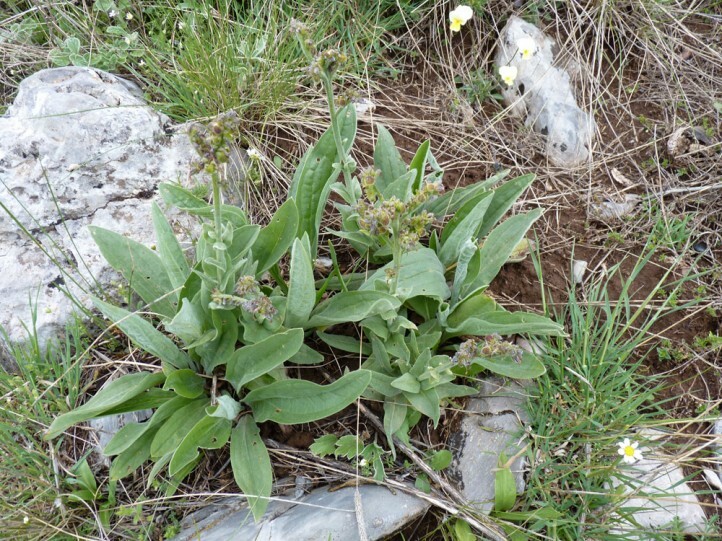 Karpenisi: Tymfristos) must be confirmed. 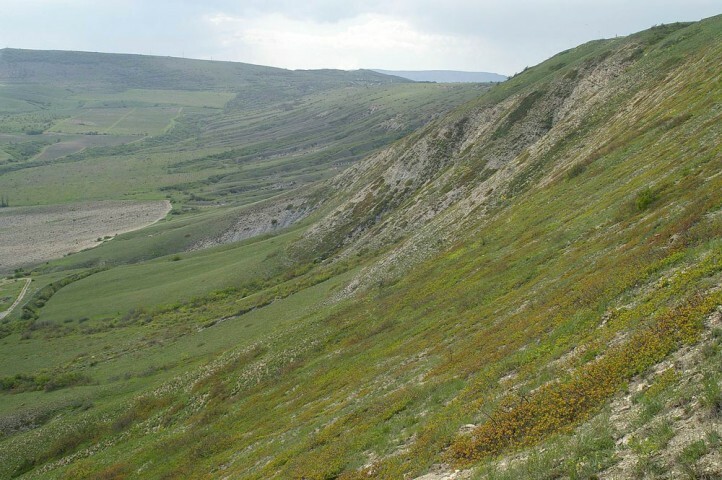 The nominate subspecies occurs in S-Ukraine (Crimea) and from Asia Minor across the Caucasus region to Central Asia.